When a young professional couple wanted to open up their apartment in Paris's 9th arrondissement, they knew just who to call. Architecture firm Batiik Studio is known for its creative approach to small spaces, and at only 678-square-feet, the second-floor space needed some smart solutions. Founder Rebecca Benichou set out to redistribute and optimize the floor plan, as well as give the clients the open kitchen and dressing area they requested. The firm painted the living room in a bright white and brought colorful accents and wallpaper into the smaller spaces, like the bedroom and powder room. Wood accents were used to warm up the apartment, from the kitchen to the dressing area. The finished project is spacious and modern — just what the couple wanted. Batiik Studio created an open kitchen, dining area, and living room. The center pillar was painted in Farrow & Ball's Inchyra Blue. A wooden bookcase holds an eclectic display in the living room. Vintage Eames chairs surround the table in the dining area. Voxtorp cabinet doors by Ikea and oak paneling were installed in the petite, single-wall kitchen. Double doors separate the living room from the bedroom. 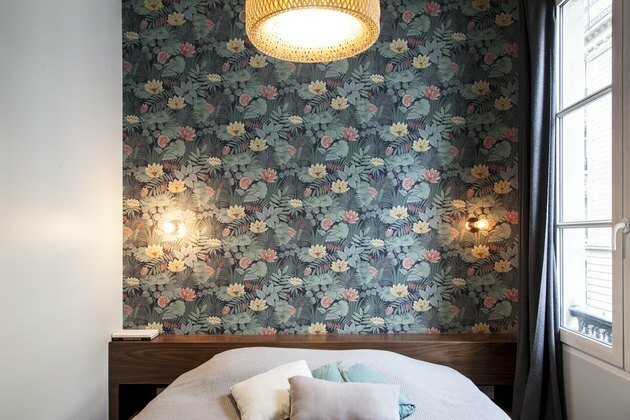 The firm wanted the bedroom to feel like a hotel, so they installed wallpaper by Little Greene and an Ikea pendant light above the bed to create an ultra-cozy atmosphere. The walnut bed is dressed with linens in cool, pastel hues that complement the wallpaper and pale blue curtains. The dressing area was designed to resemble a boutique, with dark walls and a rug. Walnut slats separate the storage area from the rest of the bedroom. A soft palette of pink, white, and beige was used in the bathroom. Square terrazzo tiles and glossy subway tiles contrast with the oak vanity. Elizabeth Stamp is a freelance writer splitting her time between New York and Los Angeles. Her work has appeared in Architectural Digest, Elle Decor, and CNN Style.